Tanzanite 4mm Bicone Drops (16) - Add 1 – Tanzanite 4mm Glass Crystal Bicone to a ball pin. Make a 90° bend in ball pin above the bead. Using round nose pliers (or any pliers you have) hold the ball pin near the angle and bend it around the pliers to make a loop. Wrap down around ball pin creating as many coils as you can. Trim any extra. Repeat 15 times. Purple Sparkle AB 4mm Round Drops (4) - Add 1 – Purple Sparkle AB 4mm Glass Crystal Round to a ball pin. Make a 90° bend in ball pin above the bead. Using round nose pliers (or any pliers you have) hold the ball pin near the angle and bend it around the pliers to make a loop. Wrap down around ball pin creating as many coils as you can. Trim any extra. Repeat 3 times. Tanzanite 6mm Bicone Drops (4) - Add 1 – Tanzanite 6mm Glass Crystal Bicone to a ball pin. Make a 90° bend in ball pin above the bead. Using round nose pliers (or any pliers you have) hold the ball pin near the angle and bend it around the pliers to make a loop. Wrap down around ball pin creating as many coils as you can. Trim any extra. Repeat 3 times. Plum AB 8x5mm Rondelle Drops (4) - Add 1 – Plum AB 8x5mm Crystal Rondelle to a ball pin. Make a 90° bend in ball pin above the bead. Using round nose pliers (or any pliers you have) hold the ball pin near the angle and bend it around the pliers to make a loop. Wrap down around ball pin creating as many coils as you can. Trim any extra. Repeat 3 times. Plum 15x10mm Teardrop Drops (2) - Add 1 – Plum 15x10mm Crystal Teardrop to a ball pin. Make a 90° bend in ball pin above the bead. Using round nose pliers (or any pliers you have) hold the ball pin near the angle and bend it around the pliers to make a loop. Wrap down around ball pin creating as many coils as you can. Trim any extra. Repeat 1 time. 1. Add 1 – Purple Crazy Lace Agate 10mm Semiprecious Round to an eye pin. Make a 90° bend in eye pin above the bead. Using round nose pliers (or any pliers you have) hold the eye pin near the angle and bend it around the pliers to make a loop. Wrap down around eye pin creating as many coils as you can. Trim any extra. 2. Open one 5mm jump ring; add 1 - Tanzanite 4mm Bicone Drop, 2 - Purple Sparkle AB 4mm Round Drops, 1 - Tanzanite 4mm Bicone Drop and Purple Crazy Lace Agate Drop you created in Step 1. Attach the Purple Crazy Lace Agate Drop using the eye of the pin NOT the loop you created. Close the jump ring. 3. Open one 5mm jump ring; add 1 - Tanzanite 4mm Bicone Drop, 2 - Tanzanite 6mm Bicone Drops, 1 - Tanzanite 4mm Bicone Drop, and the 5mm jump ring you added in Step 2 between the two Purple Sparkle AB 4mm Round Drops. Close the jump ring. 4. Open one 5mm jump ring; add 1 - Tanzanite 4mm Bicone Drop, 2 - Plum AB 8x5mm Rondelle Drops, 1 - Tanzanite 4mm Bicone Drop, and the 5mm jump ring you added in Step 3 between the two Tanzanite 6mm Bicone Drops from Step 3. Close the jump ring. 5. Open one 5mm jump ring; add 1 - Tanzanite 4mm Bicone Drop, 1 - Plum 15x10mm Teardrop Drop, 1 - Tanzanite 4mm Bicone Drop, and the 5mm jump ring you added in Step 4 between the two Plum AB 8x5mm Rondelle Drops from Step 4. Close the jump ring. 6. Open the loop of one of the leverback earrings (just twist it like you would a jump ring). 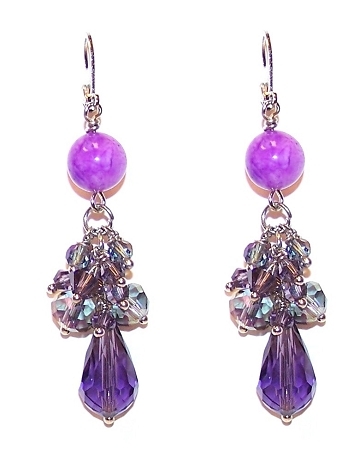 Add the loop of the Purple Crazy Lace Agate Drop you created in Step 1 and close the loop of the earring. 7. Repeat steps 1 – 6 for the other earring. We hope you enjoyed this multi-drop beaded earring beading project! For more beads and supplies please shop on our website.